This star-studded image shows us a portion of Messier 11, an open star cluster in the southern constellation of Scutum (the Shield). Messier 11 is also known as the Wild Duck Cluster, as its brightest stars form a “V” shape that somewhat resembles a flock of ducks in flight. Messier 11 is one of the richest and most compact open clusters currently known. By investigating the brightest, hottest main sequence stars in the cluster, astronomers estimate that it formed roughly 220 million years ago. Open clusters tend to contain fewer and younger stars than their more compact globular cousins, and Messier 11 is no exception: at its center lie many blue stars, the hottest and youngest of the cluster’s few thousand stellar residents. 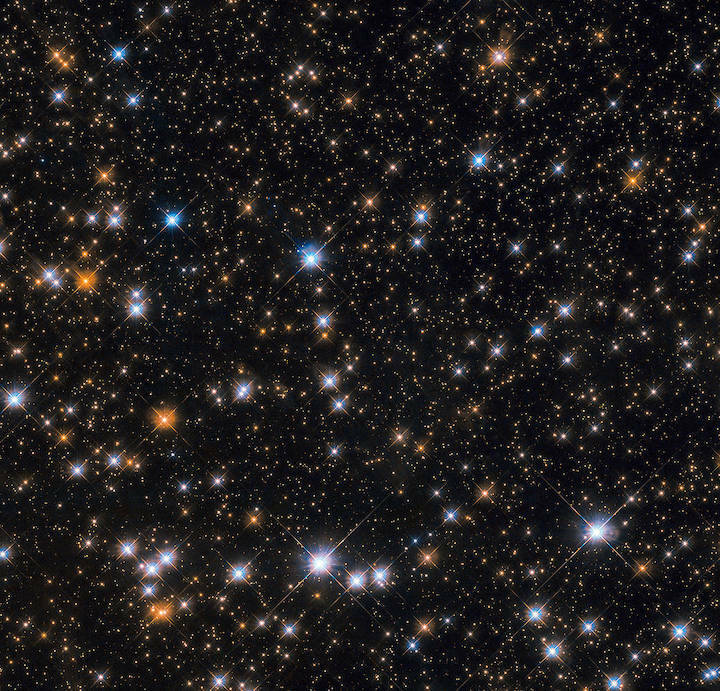 The lifespans of open clusters are also relatively short compared to those of globular ones; stars in open clusters are spread farther apart and are thus not as strongly bound to each other by gravity, causing them to be more easily and quickly drawn away by stronger gravitational forces. As a result, Messier 11 is likely to disperse in a few million years as its members are ejected one by one, pulled away by other celestial objects in the vicinity. Messier 11 is featured in Hubble’s Messier catalog, which includes some of the most fascinating objects that can be observed from Earth’s Northern Hemisphere. See the NASA-processed image and other Messier objects at: https://www.nasa.gov/content/goddard/hubble-s-messier-catalog.